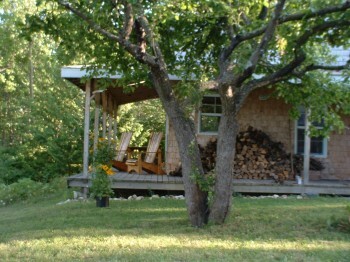 The cottage is a two level open space concept building with windows and beautiful views all around the building. While the interior of the building was reconstructed, the renovation respects the integrity of the exterior of the building as it was originaly built. You are invited to view the main floor and upstairs. On the main floor is a large open space that combines the kitchen, dining and living room areas. 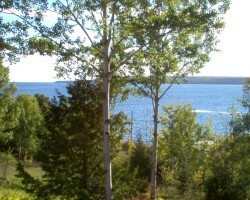 From almost anywhere on the main floor, there is a beautiful view of the North Channel. The kitchen has an electric stove, fridge, and coffee maker, and all of the cupboards were custom built. The cottage is furnished with some of the original furniture, including a hand hewn hutch, a wood box/bench and an old oak dresser. There is a Vermont Casting wood stove on the main floor. On the main floor, there is a separate back room which has an additional single bed. The bathroom is located off the back room and has a toilet, sink, bath tub and shower. The upstairs is an open loft with a queen-sized bed. You can see the Bay from the window and at night you can hear the water washing up on the shore. The upper floor is also lined with Manitoulin cedar and the floor is pine. The bedroom has a chest of drawers and a pine wardrobe. The kitchen is fully outfitted – all you have to do is add the ingredients to make a wonderful meal. Depending upon the season you can pick local raspberries or apples. Fresh Manitoulin whitefish is readily bought locally. There are 2 bicycles for touring in the village and on back roads. The cottage is equipped with a radio/CD player and a DVD player. We will provide prospective renters with a detailed list of equipment and supplies that is available when you rent the cottage. The water comes from a deep well and is filtered through a UV water filtration system. The house has a wrap around covered porch so you can enjoy the view but have some shelter from the sun.